There’s Never Been a Better Time to be an Entrepreneur! Are you thinking of starting your own business? Perhaps you’re approaching retirement and looking for a way to keep active and supplement your retirement income. Or perhaps you’ve been recently downsized and you’re looking for a way to get back on your feet by working for yourself. Maybe you’ve got an idea that you think you can turn into a great business. If so, you’re in very good company! Many thousands of people would like to start a business these days, but the challenges and hurdles can be overwhelming! To successfully start a business you have to think about things like financing, marketing, planning, selling, hiring, taxes, and legal issues. And that’s just for starters! If you’re looking for some valuable advice you’ve come to the right place. For the past several years I've been writing about entrepreneurship extensively. I've published several books and created this web site. I've been interviewed and quoted in numerous business publications here in America and around the world. If you have a question about running your business I've probably covered it. That’s important in today’s fast-changing world. You have to get off to a strong start to get out in front of the competition and stay ahead. But you can do it and it would be my privilege to lend a hand. This forthright book is a "must-read" for anyone either thinking of starting a new business or anyone already running a small enterprise. It's brimming with sharp insights and practical advice to help you navigate the road ahead. 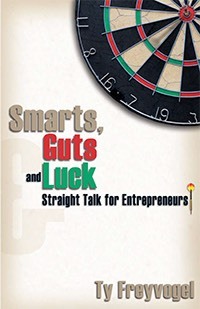 Smarts, Guts and Luck has already become a "bible" for entrepreneurs who want to avoid the pitfalls and seize the opportunities of small business ownership. 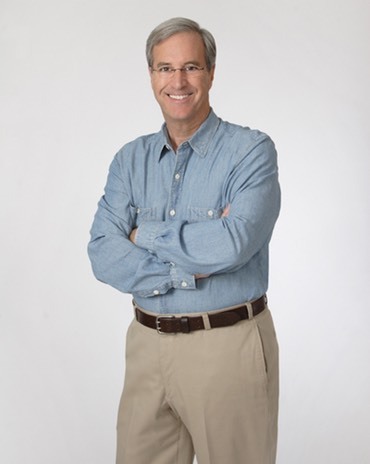 "Ty Freyvogel has a formula: 1/3 Smarts, 1/3 Guts, and 1/3 Luck add up to exactly what you need to make it as an independent business owner. In a short gem of a book, Freyvogel delivers countless secrets for success, ranging from developing one's intuition to recruiting the ideal employee and balancing life and work. There's a lot of powerful advice in here that speaks directly to the reality of being an independent business owner." One of the secrets to business success is communicating with others! 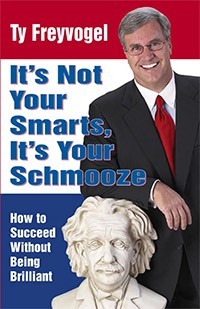 My second book, It's Not Your Smarts, It's Your Schmooze uses humor and compelling anecdotes to explain why old-fashioned “people skills” are more important than ever. In this fast-paced, high-tech, gadget-filled world, far too many people have allowed technology to get in the way of authentic human relationships! So, why is communicating so important in today's world? Because business is about people ... life is about people ... and schmoozing is about people! Networking is no longer enough. Schmoozing gives you the edge you need to succeed! Schmoozing also gives you the skills to reach beyond superficial small talk and passing acquaintance! Schmoozing is simply the art of building relationships by creating long-term bonds of trust! Everybody has the ability to succeed, and it doesn’t require brains, beauty or bucks! Schmoozers are excellent communicators who know how to listen effectively and focus on others! The 21st century has offered people un-precedented opportunities to launch new businesses and create new enterprises. But to achieve success entrepreneurs in this century have to adopt a different mind-set then was typical expectations of 20th century businesspeople. My first book, Seize the Century, laid out a roadmap and suggested multiple ways that entrepreneurs could succeed. 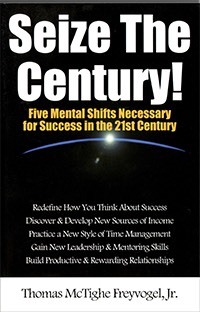 The secret is in making five mental shifts necessary for Success in the 21st Century! © Copyright 2015 by Ty Freyvogel, Inc. All Rights Reserved.